At this time of year, a drafty window or door can be a real nuisance. Throughout my years as a Breckenridge Realtor, I’ve seen homes get more and more efficient, but small problems can turn off a buyer, so today we’ll discuss some essential tips you can use to keep the cold air out during the winter months, and hopefully impress potential buyers as they tour your home. Before you do anything, finding the gap around the window frame is extremely important. Accomplishing this goal is easier than you may think. Just take a candle or lighter and move it along the window frame. Once you see the flame bend or flicker, you know you have a leak. Make sure to mark it with a Post-It note or some masking tape so that you can come back and seal it later. And of course, be careful to keep the open flame away from anything flammable in the home. Caulk is an all-purpose sealer for cracks that let in the cold. You can cover up the holes by molding the caulk to fit into these gaps. If the holes are large, remove any old caulk and replace it with a fresh layer. You’ll want to spend a little time at the hardware store making sure you get the caulk color close to the color of the window frame and the painted surfaces around the frame. Ideally you won’t notice the sealant once it’s dried. If your draft is coming from a door, consider making a draft snake to block cold air from coming through your windows or doors. There are dozens of fun patterns online and it can be a fun project to work on with kids if they are interested in crafts. If you prefer, you can also purchase a ready-made draft snake to cover any leaks you’ve found. Another great way to prevent warm air from leaving is to install interior storm windows. They neatly fit within the existing window frame. It’s easier to install these during the warmer months, but if you’re discovering leaks, it’s never too late to address them. You may also purchase a shrink insulation kit at a home improvement store and seal in the warmth that way. The process is easy. Just put the material on the interior of your window with double stick tape. Then use a blow dryer to seal the plastic film and get rid of any wrinkles. 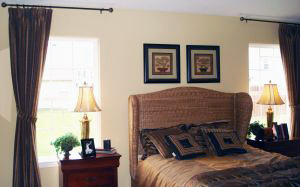 If you wish to incorporate design features into your insulation, get some heavy drapery that complements your décor. These layered curtains trap air between the fabric and the window, holding the cooler air away from the center of the room. Self-stick rubber weatherstripping is really good at sealing up those pesky gaps. You have a choice of getting weatherstripping by the roll, in sheets or even as a foam. Whichever way you choose, you’ll be able to prevent the heat from escaping with a few simple adjustments. Winterizing your home can seem like a chore, but a few quick improvements around the house can save cost on your heating bill, keep you and your family cozy, and potentially help you sell your home. If you’re on the buying side, feel free to start your research on my website. You can look through the updated listings at any time and when you’re ready to start discussing your options, we can sit down and go through the top properties on your list. When you’re ready to discuss your options or prepare for showings, contact me at any time via email ([email protected]) or on my office line. I look forward to working with you!